Nearly a third of people have some form of arthritis, while 1 in 5 will seek help because it is so severe. Nearly two-thirds of those are under the age of 65. Despite how common rheumatic diseases are, there are less than 50 rheumatologists currently in practice in Alberta, and less than 500 in Canada. Despite this, in Alberta, rheumatologists provide care to thousands of individuals each year, are engaged in world class research, and train future doctors about arthritis. Be an arthritis supporter and show it with pride. We have teamed up with RedBubble to provide you an opportunity to show your support for arthritis providers in Alberta. 100% of profit will go to support improving arthritis care, research and education. By literally wearing your support, you will raise the profile of rheumatology and ensure all Albertans and Canadians will continue to receive the best arthritis care in the world. 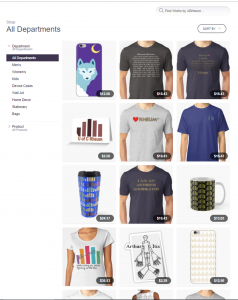 Click here to visit our RedBubble Store! To explore other meaningful ways to support arthritis care in Alberta, speak with your rheumatologist.